David Morris chased the westbound CP TEC track evaluation train on July 29. Here are a few of his photos. CP 3025 provided the power. First, the train at Harvey Lake. Note the overcast skies! Here it is, changing crews in McAdam just after noon. Note CN 7038 in the background. It left McAdam and went down to St. Stephen. Here it is, I believe, just before highway 1 going into St. Stephen. Later, David shot it going back to McAdam in this bucolic scene typical of the St. Stephen sub. Peter Gough and David Morris went to McGivney on Monday to view eastbound VIA 614 at McGivney. 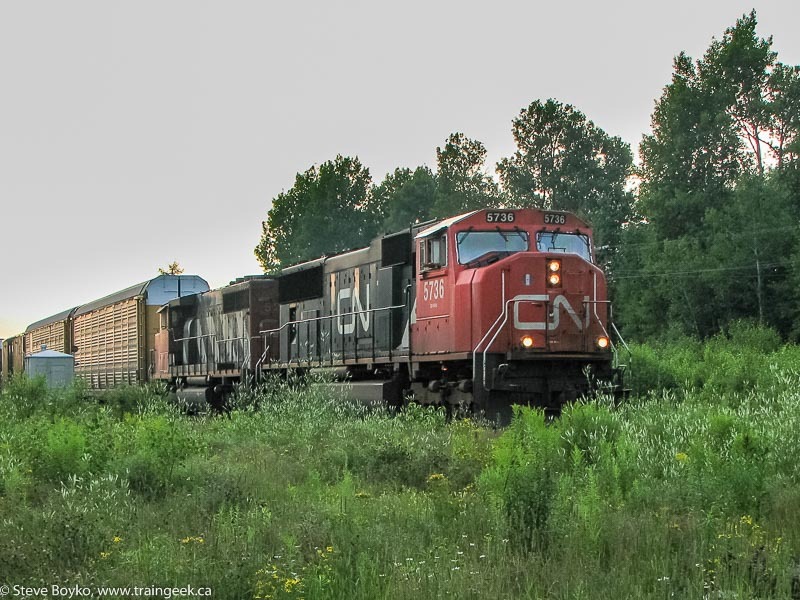 They arrived at 08:00 and by good luck, 614 was entering the siding for a meet with CN 305. Shortly after they arrived, 305 blew through on the mainline with CN 5527 on the head end. The Ocean went on its way to Moncton by 08:20. The consist for the Ocean was: 6400-6419-7003-7228-7222-7215-7108-7312-7509-7519-7309-7401-7313-7502-7501-7525-7506-7513-7504-7600-Assiniboine Park. Thanks should go to David Morris for sharing his photos. My youngest son and I went up to McGivney Sunday evening to try to catch VIA 615 detouring on the CN Napadogan subdivision. I figured it would take VIA at least 1.5 hours to go from Moncton to McGivney, so I timed my arrival to 18:45 to give them that much time. The signals were red over red both directions, so we took some time to walk around and check out the flowers, grass, and whatever else entertains a two-year-old. When. Is. That. Train. Coming?? At about 19:20 I heard some chatter on the scanner but couldn't make much of it out except that it sounded like MOW discussions. Shortly after that, I heard a CN detector report "no alarms" but I couldn't get the mileage. I figured that VIA would be along shortly. On one of my scans up and down the track, I suddenly realized there was a train coming from the WEST. "Great, a meet." But no, the train was on the main line and not slowing. 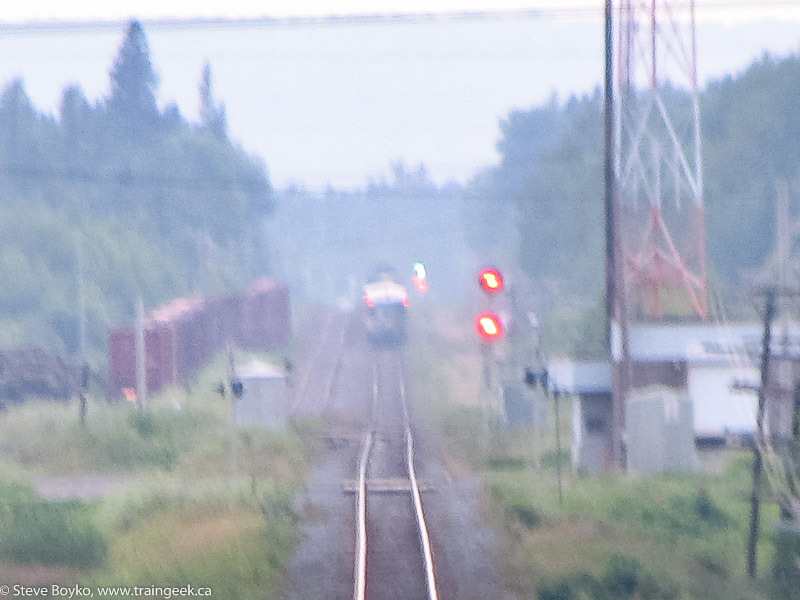 I quickly turned the video camera around and caught CN 5736 and 5293 at 19:43 with a general freight train. I was shooting directly into the setting sun, so the lighting wasn't the best. The trailing unit was CN 5293. This was probably CN 306, but I'm not sure. Shortly after they left, the east-facing signal turned green over red, indicating the RTC had lined it up for VIA. I waited and waited, but there was no indication of when VIA would arrive and I needed to get my son home to bed. We left at about 20:45. About 3 minutes down the road, I heard the scanner crackle as VIA announced they were arriving at McGivney. The Ocean was between the main signal and the dwarf signal at the other end of the siding, with the Park car literally heading into the sunset. CFMG 403 derailed around Trois Pistoles, Quebec. It looks like VIA 615 detoured yesterday from Moncton over the Napadogan and Pelletier subdivisions, and VIA 614 likely went the same way today (Sunday). No word on what will happen tonight or Monday. Here are two clips I took on May 26, when I was in the Bathurst area. First, VIA 15, led by Loto-Quebec 6414, comes to a stop at Nepisiguit Junction so the crew can reline the switch to the Nepisiguit Subdivision. The NBEC ore train usually leaves the switch against VIA as they proceed up the sub. There were quite a few bugs around at that time of night. Next, the same train leaving Bathurst. Less bugs this time! Finally, the next day (May 27) I caught VIA 14 leaving Bathurst with the Telus unit 6429 on point. I received my first slides from the John MacIntosh sale on Ebay. Here they are for your viewing pleasure. Click on them to see the large version. 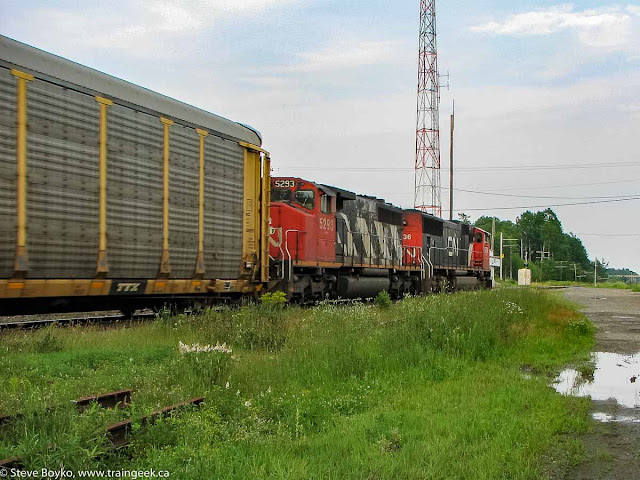 First, CP 1097 in the Fredericton yard. Unfortunately this one is blurry. I levelled the photo and did my best to sharpen it but there is only so much one can do. The next one is better quality, featuring the CPR train leaving the CN mainline at Norton to go to Chipman on August 5, 1958. Now a question on this one... is it CP 136 or 144 pulling the train? The engine number is too small to read, except that it is 3 digits. Matt the saintjohnrailfan left his native home and went to Moncton to shoot some trains. He brought his new tripod with him and the results are great. As I've said before, a tripod makes a big difference when shooting video. First he went to Berry Mills and caught CN 305 leaving Moncton around 09:15 with CN 5558 and 2425 pulling 70 cars. Next, he set up in Memramcook on July 23 and caught CN 407 on its way to Moncton, with 2673 and 8014 for power pulling 89 cars. Here's VIA 615 in Memramcook on July 23 on its way to Moncton, with VIA 6400 on the point shortly before 5 PM. Matt caught the same train at Berry Mills after it left Moncton. Finally, he got a "grab" video of CN 408 in Moncton in the evening. The CP train left Mattawamkeag at 10:05 our time. It should be in McAdam at or about noon, then leave around 30 minutes later, arriving in Saint John by 2:30 or so. Hopefully the rain will let up so people can take some photos. I doubt I will see it today. I just heard that the CP track geometry train will be in Brownville Junction, Maine tomorrow (Friday) at 8 AM. It will proceed directly from there to Saint John, NB without working. I suspect it will lay over for the weekend and work back on Monday. Expect it in McAdam by noon Friday and then Saint John by 2 PM or so. As I mentioned earlier, CN 7038 was in McAdam on Saturday and returned to Saint John on the afternoon eastbound. Here's a little video I took of it shunting near the station in McAdam. VIA 615 (Halifax-Montreal) was terminated at Campbellton last night / this morning due to a defective wheel bearing. It was taken to the Eastern Railway Services (ERS) shops to be repaired this evening. Michel Boudreau reports that they stopped at the Nepisiguit sub switch as usual, to reline it for the mainline after the ore train went through. 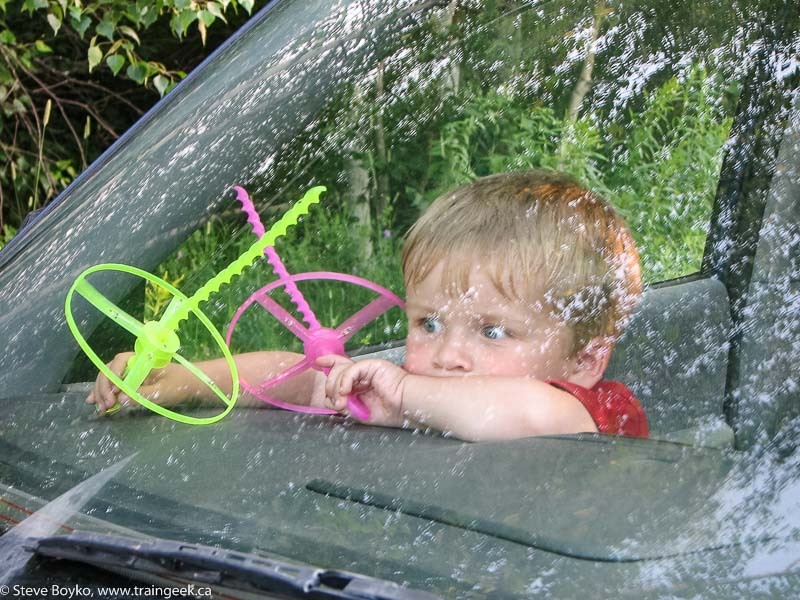 There or shortly afterward, they received a hot wheel bearing warning, did an inspection, then proceeded to Bathurst. At Bathurst they decided to continue to Campbellton, and then the decision was made to stop there. The passengers were loaded onto buses to continue on to their destinations. Apparently VIA 7217 (a coach) was the problem car. Michel posted a video of VIA 615 arriving and departing Bathurst. At the end of the video you can hear a report on the hot wheel. I happened to be in Grand Falls today, and found the old CN railway station. Here are a few photos. There were about six covered hoppers on the south siding (EH44TT? ), and one covered hopper on the north siding (EH45?) with a conveyor system under it. The signals were red over red facing west. Joel Scott aka jamminjoel was busy taping trains all across the Maritimes. Here's CN 121 at Fall River, Nova Scotia in the evening of June 28 2008. CN 5780, 2517, and 5762 lead 76 container cars. Because of a slow order, he was able to shoot it again at Enfield, NS. Next, CN 120 at Windsor Junction early the next morning! This time it was CN 8821, 5607, and 5715 with 76 cars. Finally, he shot CN 305 at Parker Ridge, NB just after noon yesterday (July 19) with 3 engines and 123 of the usual dog's breakfast of cars. Thanks for sharing those, Joel! Wendell Lemon reports that "A tour of several old homes and the ex CPR Codys station will be held on Sunday afternoon with the few remaining CP men on site who once worked the Minto Sub through Codys, milepost 70.1. This end of the Minto sub was home to CP's last three 4-4-0s and two early diesel-hydraulics up to Apr.1962. Everyone interested is welcomed and encouraged to bring old photos and ask questions. I hope to be there with a few old pix... Codys is on the south side of Washademoak Lake on rural highway 710 in Queens County. See you there maybe." There are articles on this in the Telegraph Journal and in the Times & Transcript. Codys station in the 1930s, from the Paterson-George collection. Steam engine 29? with two cars approaches from Norton. The former Codys station. Photo by Art Clowes, August 11, 1996. I decided to go to McAdam today with my two youngest kids. I knew the weather would not be great, but it has been a while since I've been out railfanning and it was time. We arrived at 12:30 and found two units in the yard, NBSR 2612 and CN 7038. I knew the CN GP9 had been there for a while, on the Saint Stephen (South) Job, but it was a surprise to see 2612 there. I understand she had a traction motor fire and was set off Friday night by the westbound freight. 7038 had an alarm bell ringing and her radio was on, so I assume it has some kind of SmartStart device in it to save fuel. We grabbed some hot dogs at the place next to the Family Restaurant and then came back to witness NBSR 2318 East arrive at 13:00 precisely with 2318, 2317, and 9801. The three units took the front cars and pushed them back into the west yard. They then waited out on the east side of the yard. Afterward, 7038 pushed five cars up to the pulp transload facility, then joined up behind the eastbound's power. My kids were providing a running commentary throughout the video! The train left at 13:43 (without 2612) and I headed to my favourite spot at Harvey Lake to tape them. I decided I would forgo any still shots and do a long pan of the train as it went around the lake. I'm pretty pleased with the results. After the train left, we threw stones in the water, watched the resident Canada geese, then went back to Fredericton. I want to give a shout out to Chris Gallant, conductor, who took the time to say hi to me. I'm sure we'll meet again! An article in the CBC says the Port of Halifax will be holding CN accountable for on-time delivery, given its recent reduction of container train service from two trains to one. There's a new person posting Maritime videos on YouTube, trainboy1979. Here's what he has posted so far. This is a recent video of NBEC 403 near Beresford, NB. The power was a very clean CFMG 6907, NBEC 1851, NBEC 1819, and CFQC 3000. The train had the usual collection of boxcars, tank cars, loaded Chaleur Paper cars, chip cars, Ultramar ram, and CN covered gondolas. Very nice light in this video. Here's a side shot of VIA 14, from across a road. There is no date, but it can't be too recent because there is no Park car on the tail end of the Renaissance consist, and very few leaves in the trees. 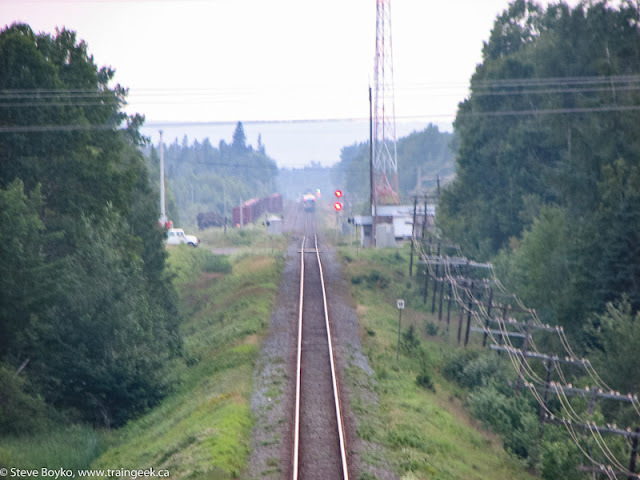 Finally, we go out of province to Nova Scotia for a CB&CNS train leaving Port Hawkesbury on July 15, 2008. I spotted a few paragraphs referencing the Acadian Railway in Railway Track & Structures. The article, entitled Developers eye new eastern Canadian rail line, quotes Peter Swire and Anne Hébert, general manager of the CENB. If you happen on this entry a little later and can't see it in their "Breaking News" section, try their news archive for July 11 2008. Chris aka clam502 posted a video of NBEC 1857 from Saturday morning on the Cascapedia subdivision, with a loaded lumber car and five ballast cars. Michel Boudreau aka NBECMich braved the bugs to film VIA 615 near Petit Rocher on its way back to Montreal. The first unit looks like a Spiderman unit and the second is the CBC unit 6403. Chris then shot the same train at Dalhousie Junction in the fading light. I like the mood of this video, with the car lights against the late evening sky. There's an article on the Acadian Railway in the New Brunswick Business Journal. It quotes Peter Swire, promoter, and two people from the Conseil économique du Nouveau Brunswick Inc. I found it interesting that they photographed the chairman of the CENB in front of the CN yard in Moncton. I'm quoted in Charles Leblanc's blog for becoming the president of the Fredericton Friends of the Railway Inc.. I assumed those duties a short time ago, and hopefully we can get things moving on the poor station soon. I know everyone in Fredericton wants something to be done about the station. "Fix it or tear it down" is the common refrain. "Tear it down" is not an option to me, for two reasons - the station is too important for that, and it's prohibited under the Heritage Railway Stations Protection Act (PDF) of 1985. If you have any ideas, thoughts or suggestions, let me know! Container trains CN 122/123, which ran between Montreal and Halifax, have been cancelled. They didn't have a long life, since they began in late November last year. As of now there is only one set of container trains coming into Halifax, CN 120/121. I understand CN 473/474 (Joffre-Moncton) has gone from "as needed" to daily. This should bring in the head-end freight that 122/123 used to carry. Expect CN 120/121 to get very big. The last CN 123 left Halifax on Tuesday night. Doug Conrad reported tonight's CN 121 has four units: 5641, 2657, 2405 and 5410. What does this mean? For CN, it will help alleviate their crew shortages and will probably save some money in the short term. 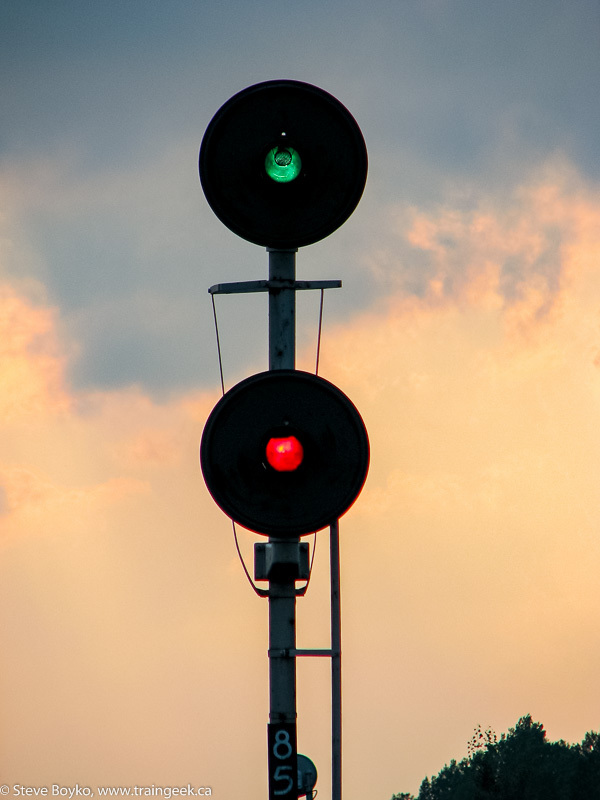 For shippers, unfortunately less trains mean more chances for delay. Here's my only glimpse of CN 123, during the detour on the NBEC at the beginning of May 2008. David Othen very kindly gave permission for me to post some photos and information about the VIA cars involved in Friday's collision. First, the location. I had thought the collision was just as the Ocean came out of the balloon track at Halifax Ocean Terminals. Not so! The Ocean was already out of the track and crossing over to the rightmost track, prior to backing into the Halifax station. See photo below where the MOW crews are working. It appears VIA's engines were on the last switch, just pulling onto the rightmost track when CN 121 came around the corner and hit them, possibly between the second engine and the baggage car. I repeat, this is how it appears to me. The damaged engines and cars at Halifax. David went to the Halifax station in the morning of July 8 to take these photos and see what he could see. I'll let him explain. 4 cars obviously couple and all appearing to have crumpled into the next car: 7011 (Baggage), 7223, 7225, and 7200 (all coaches). In the main station platform were two groups of cars and a car with one end lifted by a crane: 7316 (Service car), 7402 (Diner), 7308 (Service Car), 7518 and 7515 (Sleepers). Separate string closest to buffer stops: 7507, 7512, 7516 (Sleepers), 7601 (transition car), Yoho Park. Speculation: 7011, 7223, 7225, 7200 are all unserviceable. I have heard reports that the interior damage in the crumple zone is extensive and that they will be out of service for a long time. Thank you, David, for giving me permission to post those. Please visit David's web site and have a look at his excellent videos for sale. After Friday evening's collision in Halifax, VIA has been running buses between Moncton and Halifax to serve its customers. No more, apparently. I'm told VIA 14 went to Halifax Tuesday afternoon. VIA 6400 brought 5 Renaissance cars to IRSI in Moncton on July 5 and they were cleared for service on July 7. Apparently the damaged cars are still in Halifax. David Othen provided a detailed list and I will ask if I can post it here. JF Dumont and Bernard Babin reported that a special VIA 14 was in Charny, Quebec Tuesday evening with engines 6431 and 6408 with 1 baggage car and 4 coaches. Normally the Ocean does not run on Tuesdays. I assume there were no passengers aboard. It looks like there will be a VIA 15 from Halifax around noon today... I'll keep you posted. David Chiasson has a great video showing NBEC 1849 and CFMG 6906 turning on the wye at Nepisiguit Junction, then heading off to Miramichi. Chris aka clam502 caught VIA 15 (the Ocean in Charlo with the Telus unit 6427 on the point. He also shot the Chaleur at Cross-Point, Quebec on its way out of the Gaspe. Thanks for posting those, Chris! While being turned at Halifax Ocean Terminals (HOT) in the evening of July 3, the Ocean collided with CN 121's engines. It appears that four cars of the Renaissance trainset are damaged, most critically the baggage car. Since the baggage car provides the North American coupler to attach to the engines, none of the Renaissance cars can be used. No cars were derailed. By 0830 in the morning of July 4, all the VIA equipment was at the station with the first five cars on the track closest to the Superstore and the others on one of the station tracks. I have to assume that some kind of chain was used so the engines could pull the rest of the cars. So far passengers between Halifax and Moncton are being bussed, with the Ocean being turned at Moncton. 5 busses took passengers from Moncton to Halifax on July 4: 4 with 191 passengers to Halifax and 1 for local stops between Moncton and Halifax. This morning's (July 5) VIA 614 had a Renaissance baggage car behind the Park car. Bill Linley reports VIA 6400 left Moncton at 17:15 for Halifax with the baggage car, and it should be arriving in Halifax about now. Thanks to Geoff Doane and "icle_mlr" for all of the reports from Halifax. Danny McCracken was kind enough to send along photos of two NB Southern Railway GP9 units that I did not have photos of, namely 3735 and 3757. Here they are! NBSR 3735 in McAdam on November 2, 1996. Photo by Danny McCracken. NBSR 3757 in McAdam on May 26, 1997. Other units behind 3757 are 3701, 3795 and 3787. Photo by Danny McCracken. NBSR 3757 in McAdam on February 18, 1997. Photo by Danny McCracken. Thanks for the photos, Danny! This is the first bilingual train order I've seen. It sounds like everyone had a good time in McAdam, despite the cancellation of the NB Southern excursion train. Speaking of that train, apparently all three passenger cars have been bad ordered and will be undergoing refits. Rumour has it they will finally get waste retention tanks added, just like VIA Rail's cars have. I'm sure the MOW crews will be happy. The Daily Gleaner is reporting that Moncton-based IRSI has filed a greater than $100 million bid to refurbish VIA Rail's LRC cars as part of the $691 million renewal project VIA announced in October 2007. I wish them good luck!